Charcoal grey suits will dress up your casual attire, making it easy for your looks to go from day to night. To complement the darkness of deeper grey tones, try out accompanying pieces in other dark classic colours for a more refined approach to casual wear. Navies, burgundies and emerald greens work nicely, particularly in lightweight sweaters that can be worn under charcoal grey suits. Pair with a rusty brown belt and matching loafers or Oxfords for a traditional approach to this tone. For more of a modern aesthetic, incorporate blacks and bright whites to keep your charcoal greys stark and the focus of your looks simple but visually appealing. 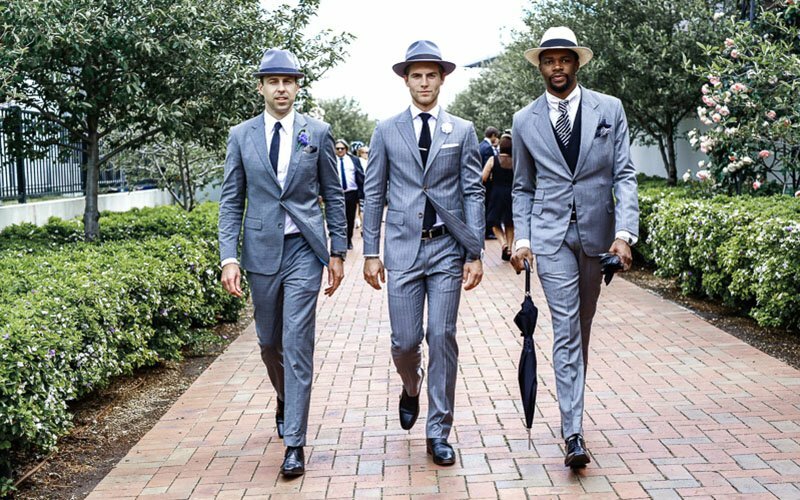 Charcoal grey suits may have proved popular for the office, but these versions of the typical grey suit have also become a favourite option for weddings which can be a refreshing change from classic black suit. Remember your fit needs to be perfect and your shoes pristine. Crisp white shirts are the usual favourite for charcoal grey suits, and navy silk or knitted ties are the perfect accompaniment. Also, do not fear ties in other brighter colours, as they can boost the appeal of an ordinary grey suit. Oxbloods, browns and navies are worthy options and will lend a classic vibe to your looks. Add a silver tie bar for an extra bit of polish. 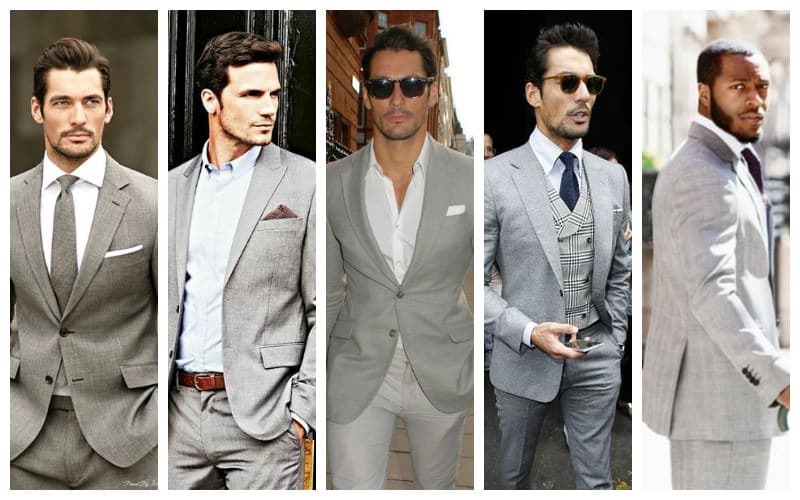 So we’ve established that grey suits are versatile that work well with a wide number of colours. But which coloured shirts are your best bets? 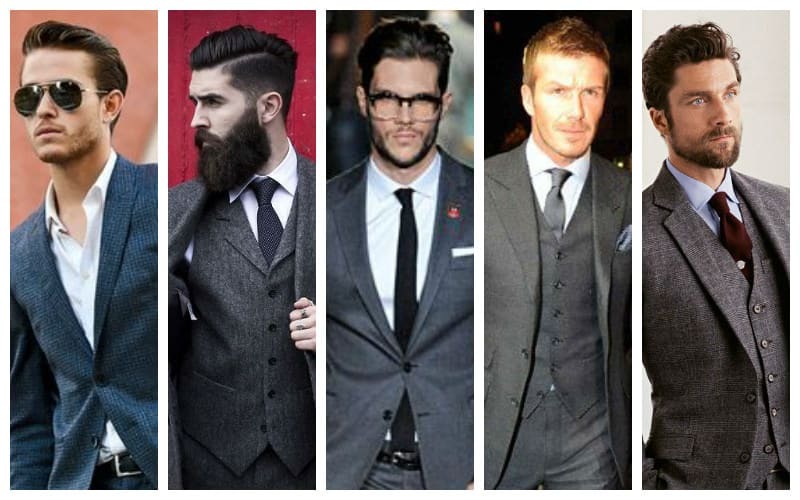 Here are the suit and shirt combinations that always look amazing. Probably your safest option when it comes to grey suits is white shirts. 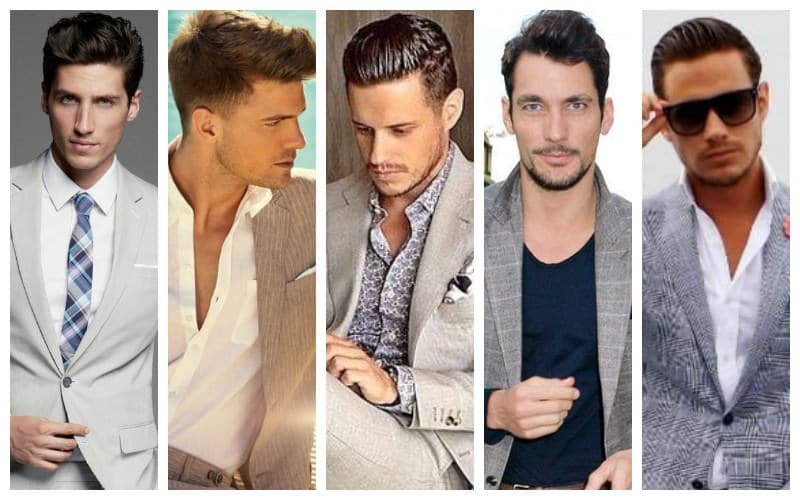 Given that wearing grey is all about complementing, a white shirt gives you a crisp edge. For a smart casual look, you can opt for a white t-shirt with your suit. Combine it with some fresh-looking white trainers for a winning style. If you’re looking for something a bit more formal than a stark, white shirt with a black tie is a reliable combination. As always, don’t be afraid to experiment with some coloured ties and pocket squares to bring something bolder to the ensemble. Not all shades of blue will look appropriate with your grey suit. For example, a deep blue shirt may be too much to work with a light grey. 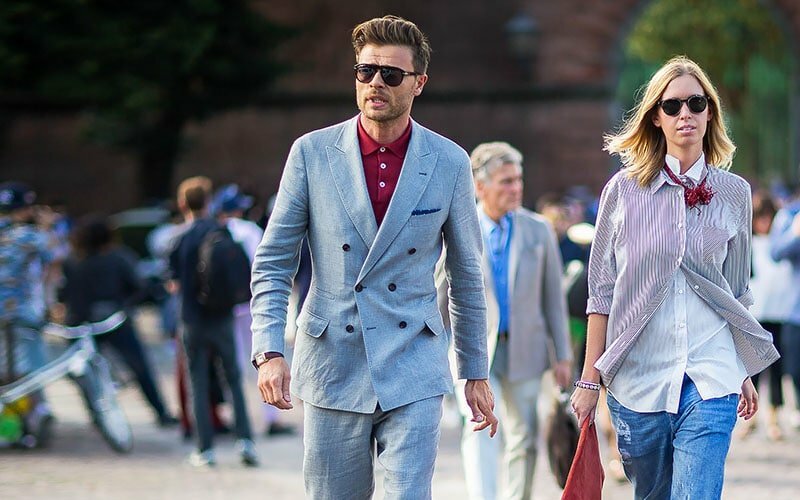 For a more casual look pair a light grey suit with a muted, powder blue. It will give your style a summery daytime vibe. Charcoal suits can be paired with deeper blues, making for a more appropriate office colour combination. If you’re wearing a tie, a darker shade of blue is a powerful colour combination with the lighter shades of blue. For a particularly sleek look, you can pair your grey suit with a black shirt or turtleneck. Given the heavy look of the tones, this pairing will look best on people with darker skin tones. The result of the pairing is a very chic and clean aesthetic that’s perfect for more formal occasions. With black shirts, you should choose a tie that is one or two shades lighter than your shirt. You can even choose a tie in a shade of grey that matches your suit’s tone. If you opt for no tie, you can feature a pocket square in black or light tones. The pairing of grey suits and red shirts is a powerful one, though can be risky if you happen not to get the right shade of red. Avoid red shirts that are too bright. The grey will make for a juxtaposition that makes the shirt look brighter than it is. Deeper reds and burgundies, however, can be a strong pairing. When it comes to shoes, it all depends on the tone of grey you are wearing, as well as the formality of the place you are going to visit. For casual wear, you can be more flexible with trainers or sneakers to pair with your grey suit. Feel comfortable making bold choices – grey is, after all, a neutral colour and can handle a lot of colour. For formal wear, keep things classic with Oxfords and simple lace-ups as well as loafers. Tan rusty browns, black and burgundy all work for the different tones of grey. Burgundy is a nice alternative to the classic black and brown because it warms up grey tones, lending a bit more dimension to your looks. 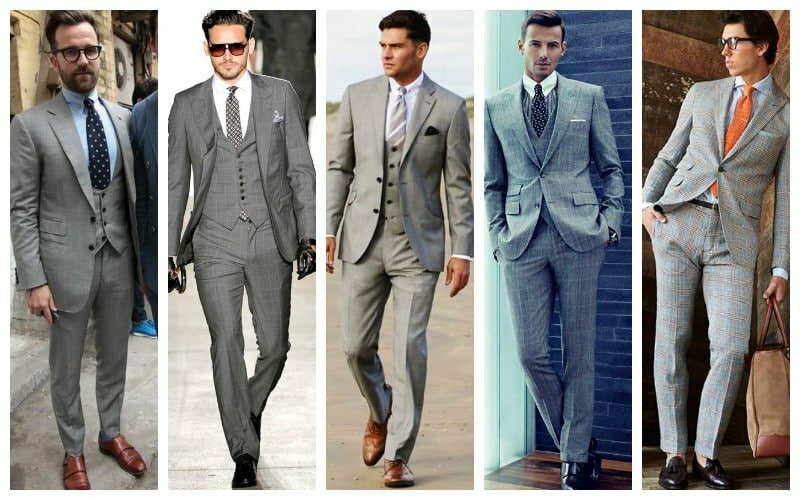 The shades of a grey suit sit on a long sliding scale. From the casual lighter greys to the more serious charcoal, there is a time and a place for each different shade of grey. 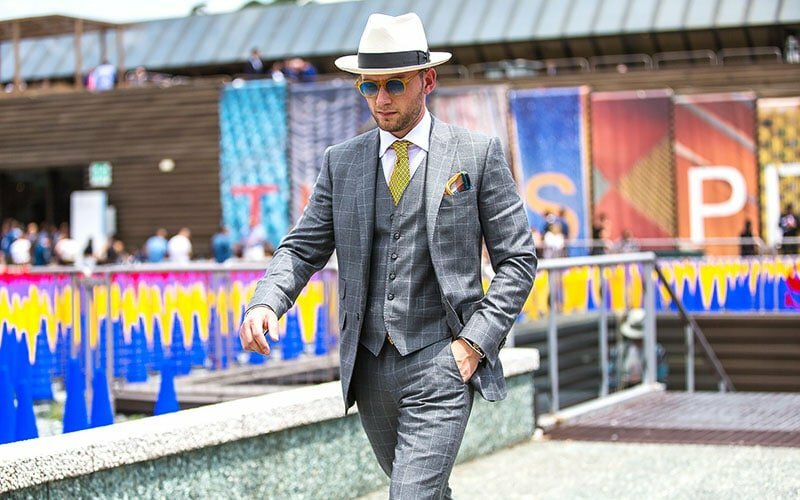 When picking out your grey suit, colour should be your first consideration. Think about when you will most likely be wearing your suit, will it be during the day or night? To what events will you wear it? Is it for the office or for a party on a yacht? Your skin tone will also come into play in your decision on suit shade. Lighter grey tones work better for those with fairer skin. While those with darker skin and darker hair will look better in charcoal and darker greys. 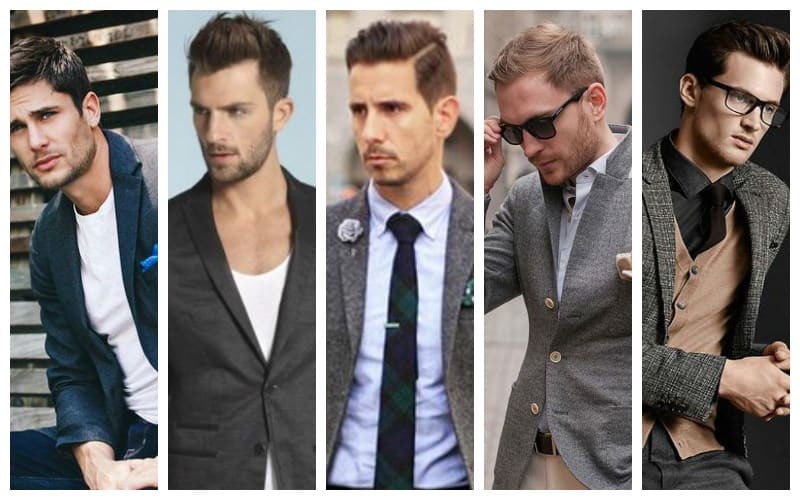 For a versatile shade, you should opt for a grey that sits somewhere in the middle of the scale. Opt for a solid colour, stripes and checks are more likely to age faster. You’ll get more use from a suit in a mid-grey tone both at the office and in more casual situations. Mid-grey is most complementary to other colours, meaning you won’t need to update your whole wardrobe around the suit. To dress your grey suit down to a smart casual look, pair it with a solid colour t-shirt and ditch the socks. Wearing so much grey can threaten to send your look into ‘drab’ You can avoid this with smart accessories. 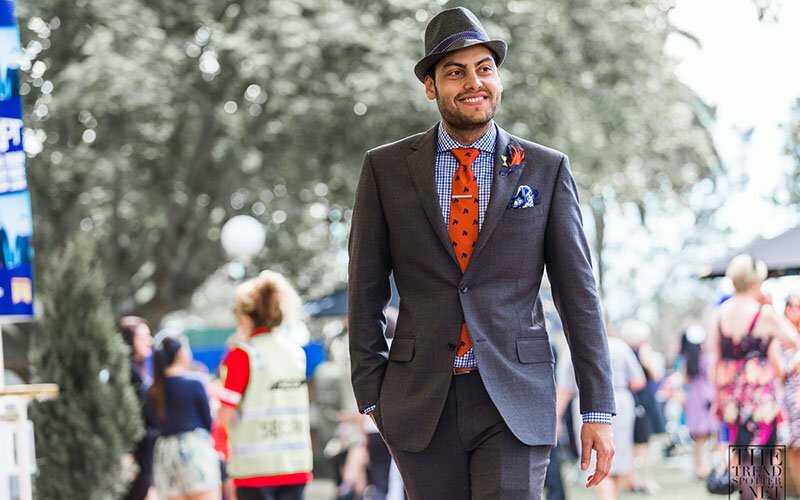 Add some colour with a patterned tie and pocket square. Go with accessories that are the same colour as your shirt, but in darker shades. Silver and white gold accessories work well to set off the metallic character of grey. You can incorporate silver tie clips, cuff links and lapel pins for something eye-catching. Given that your grey suit is so versatile, you have a few different options when it comes to shoes. The safest option is a pair of lace-up tan or burgundy shoes. The detail of a pair of brogues working particularly well with the grey. Black is a good option too, lending a more formal tone to the aesthetic. The beauty of the grey is its neutral character, meaning that if you want to wear something a little louder you can. For a more casual look you can match your suit with a pair of sneakers or trainers and no socks. As is always the case when you buy a suit, the fit can be the difference between dazzling and disappointing. The suit’s jacket will be the focal point of the whole operation, so any bunching or sagging will stand out. If you don’t have the time or money to see a tailor there are a few considerations that you should take into account when buying. When you try on your suit, it needs to look good in your natural stance. 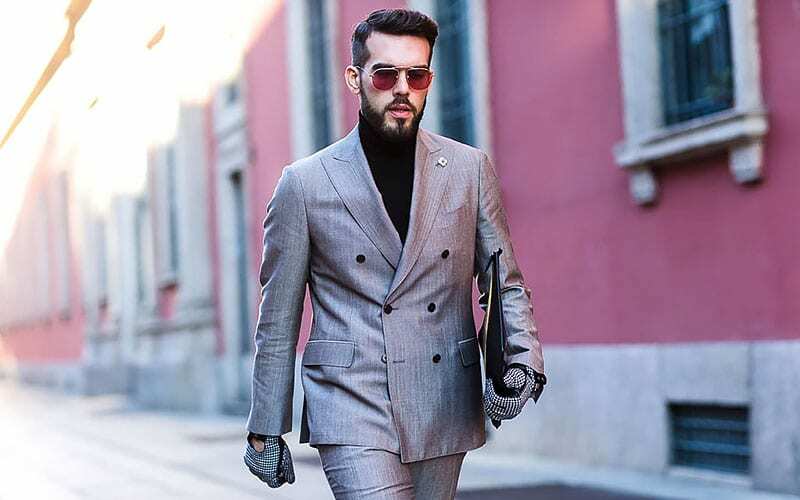 Look at the shoulders, the seam connecting the sleeves to the jacket should meet where your arm meets your shoulder. The back of your jacket should fall over your behind, while your trousers should sit loosely on your seat without bunching or sagging. When standing, a closed jacket should not pull at the button, it’s a bad look and can result in a strained button hilariously popping across the room after a hearty meal. In terms of the suit’s cut, it’s best to opt for a classic style. That means two-button, notch lapel and double-vented. 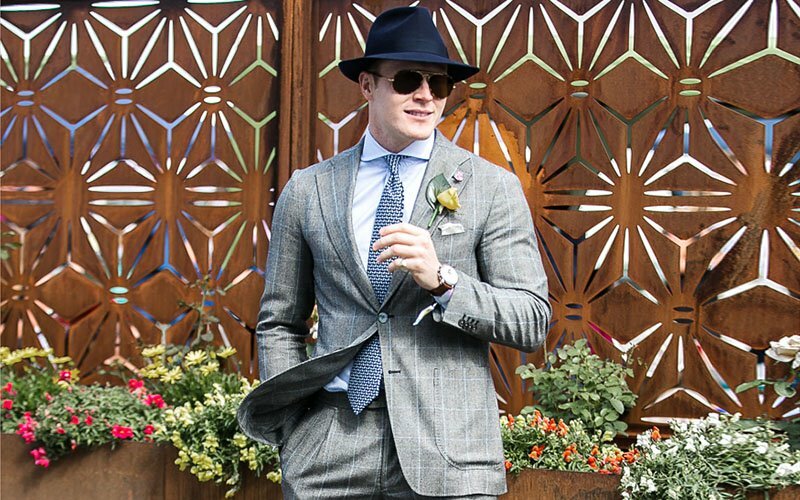 A classic style is less likely to date, meaning you’ll get more years out of your grey suit.